M&P9 Shield Performance Center model is 9mm, has a 3.1 inch ported barrel, awesome sights and holds 8 rounds. Be sure to grab a deal on ammo with flat rate shipping for more shooting fun. Ported, low kickback, Tried gun at shooting range and liked gun. Hi-Viz sights are nice in daylight. Thumb Safety and fit my hand. After reading up on this particular item, everything about it was perfect. I have owned a Shield before but had to sell it, much to my chagrin. As I have gotten older I have found that fiber optic sights really help my shooting and the performance center trigger will be a great blessing. The porting will also help me stay on target and it might even help my arthritis not hurt as much. looked for a 9m and had good reviews. I have large hands and this one is perfect. Also but most important is the quality and reliability of Smith & Wesson. It is to be utilized for concealed carry. Have 2 shields and decided the pc is easier for me to go with the upgrades I wanted than to do one myself. My brother owns one as part of his concealed carry guns. He recommended it. Its small yet not too small for conceal carry. great price, great reviews. practiced with one at the range, loved it. first gun purchase, excited to receive this. It's already a great gun. But with the up grades for a little bit more, it was an easy choice for me. Especially with great price from GRAB A GUN. I believe it will be a great CC weapon with the Hi Vis sights and the ported barrel as to getting more accurate shots off. Already have a Shield but find it very snappy. While I carry it daily I don't practice as much with it as I should. So purchased this ported version with the hope that the ports will tame the recoil enough that I will take it to the range more often. The hi viz sights and ported barrel was the reason I chose this gun. Many Reviews: Accuracy, fiber optic sites, ported barrel and compact size for conceal carry. More accurate than other 9mm pistols. Good price. It has all the features I want including Hi-Viz sights and a thumb safety. It is the perfect size for carry. I wanted to save some money on ammo. Shields are very reliable guns and it had the best price we have seen. The performance center was bonus in my eyes as I had wanted a 2.0 with the Hi-VIZ sights. This gave the trigger work and hi viz and porting. neg- will need more stippling to be near 2.0 upgraded Shield. Easy to conceal. Fits hand. I was told by several good friends about Grab A Gun and they are the best deal I could find on my selection of handguns. I read 46 reviews that each gave this handgun five stars. That's good enough for me. Also, the ported barrel, with less recoil, was a selling feature. Excellent pistol, well built, reliable, concealeble, i am a beginner but i found this gun to be very accurate and fun to shoot. 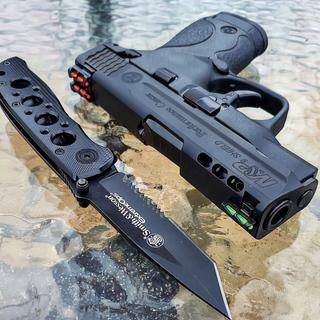 Does this gun have the option to increase palm grips similar to how the full size Smith & Wesson M&P? Does it come with different grip sizes? BEST ANSWER: It does. Mine came with three different palm swell options. Fantastic gun, by the way. 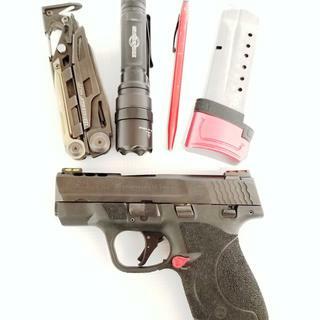 I use it for concealed carry every day and it has the right combination of size, capacity, and accuracy. My wife loves her Shield as well. No, it does not have that option. It is a rather slim grip that adds to its concealabilty, but may be too slim for some. You could add an aftermarket grip sleeve if you find it is too slim for you. It is a very concealable, accurate gun. I sm very pleased with mine. I have had an XDS, and a Glock 43, but like the Shield much better. No, it does not. I use this for undercover work or super conceal carry. The ported barrel makes it a very nice shooting gun. I have large hands and have no trouble shooting this weapon. No. The frame is a standard Gen 1 Shield. The primary differences on this vs a standard are a porter barrel and performance trigger. Is does not come with different grip sizes. I have not checked to see if larger sizes can be added as mine fits my hand ok.
You can add a Talon wrap to increase size but it is not adjustable. Yes, there are aftermarket base plates extensions. Yes, I'd also suggest the Talon grip tape. Does the performance shop have a better trigger than the standard version? BEST ANSWER: I own both the standard M&P 9 Shield and the Performance Shop Shield and I feel there is quite an improvement in triggers in the Performance Shop trigger. I would say yes. And I think the new 2.0 version is a bit better too. Love this for carry, but to be honest, with fat hands I shoot my full size pc 9L much better. Much, much better trigger - lighter and more smooth. So much so that my dad sold his standard version after shooting mine and bought a Performance Center one. Yes the PC model has an enhanced trigger. It is noticably crisper on the break & reset. Excellent shooter! Yes. All performance center triggers are considerably smoother than stock with a shorter reset. Yes, the trigger in the performance version is a better trigger than the regula shield. Somewhat better. I feel either is a great weapon. This is one of the smoothest shooting 9mm I’ve ever had the pleasure to own. Accurate, reduced muzzle climb, a LOT of flash! If nothing else it would get an opponents attention! Easy to conceal really one of the best all around CC firearms. It fits the hand so well and the Hi Vis sights are much better for me. Nice; lightweight,compact,good looking gun and I like the thumb safety: well built..
Excellant would recommend dor personal use. Excellent firearm and value. Light weight, east to disassemble. Trigger is a little long, but can get used to. Ran only 50 rounds through it , so I still need to shoot it more. Easy to conceal. Spring in magazine very stiff which should loosen up over time. Fantastic conceal and carrie pistol. Grab A Gun had an unbeatable price and the shipping was extremely fast with no problems. S & W winner again. Ported barrel does help and the sights are wonderful, but not so much with the trigger. The trigger doesn't seem much better than the regular Shield. The Performance Center Shield is really nice overall. After owning this for a while and shooting it alot, it's awesome. The only improvement needed is the grip texture as I prefer rougher stippling. This is an excellent gun. Easy to shoot and very accurate. High vis sights are very nice and so far has had zero misfires. 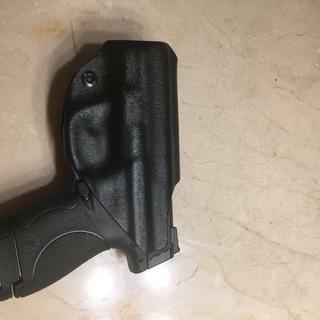 I find the trigger is perfect and like the grip.i don't see any reason that I would make any changes to this gun. Performance Center has done a fine job already. 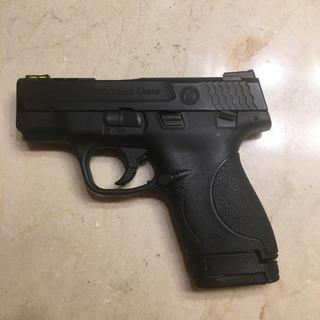 Perfect size for conceal and carry and fits perfectly in my hand and is comfortable and fun to shoot! Excellent shooter. Fits large hands when using 8 round magazine. A definite must with the Hy-Vis sights. Excellent service and very fair price. Not crazy about the shield until it breaks in and then I love it. Sight improvement on the pc is nice. Awesome lil gun, great for concealment, every day carry. Small enough to conceal yet handles fantastic. I like this product. It fits my hand and is easy to conceal w/ a 3 inch barrels. The safety might be a little difficult. I purchased this for my wife and the same for me in the .40 and both are just incredibly light and comfortable. My wife was knocking out the bullseye and she has only fired once when she was a kid.Our transaction went smoothly and shipping was quick and infidel guns and gear where we took transfer was very nice and knowledgeable making the whole experience great!!! Thank you G-A-G and Inf. guns and gear!!! Probably the best carry 9MM i have ever owned. The porting on top definitely helps with getting back on target. And the High Vis sights are great. My purchase with GrabAGun was outstanding! super fast delivery. Will use them for all my next purchases. Check them out, you will be as happy as I am. Slim and light for concealed carry. Not a joy to shoot, but not terrible. Recommend this above most in its class, based on brand reliability. Love this weapon! And love the dealer too! Great Accuarcy. Nice size and numbers of upgrade Options. The slide and barrel porting really do help eliminate a good bit of the expected "Muzzle Flip" on this pistol. SHot it side by side with my Kahr CW9 and it proved to be much easier keeping the S&W on target. The shield just got better!!!! Under 4 bills!!! Say no more and buy it now! Absolutely perfect carry gun. Loved my first shield but the upgrades are easily noticeable and worth every penny. Ported barrel, upgraded trigger, etc!!! Love it! Very very happy. Very comfortable with extended mag. Short mag a little harder to hold on to. This pistol is awesome and I would recommend it to anyone, the trigger is smoother than my standard Shield and the sights are unbelievable. I did notice a little less recoil because of the porting and blinding flames that I have heard some say. I liked it so much I bought the 40 also. Great hand-gun, have put 5,000 rounds in it with no problems. Whole process with Grab A Gun was fast and easy. I ordered on Monday and received pistol on Wednesday. The Performance Center Shield is everything I expected and more. Very nice to hold and shoots flawlessly. My new EDC. Love the Hi Viz sights. I purchased this gun after shooting many different small firearms. I used this when I attended the hand gun carry permit class as well. I have rather long fingers and the grip is the perfect fit. The slide is easy to rack and the recoil is minimal. It is also super easy to disassemble and clean. I highly recommend this firearm! Decided to purchase this gun just from all the good reviews. Did not anticipate my difficulty with racking the slide. Arthritis is no joke. A definate improvement over my original shield. The muzzle flip on the original 9mm was very manageable. Now it’s almost nonexistent. The trigger is also smother, cleaner break and shorter reset. I put a Hyve +2 mag extension on the 8 round mag and the fit is perfect. I actually prefer this over my Glock 43. Great for carry and conceal. Perfect size and fit. Reliable. Perfect for conceal carry. Good quality 9mm especially for the price. Easy to conceal and lightweight. Feels comfortable in my hand. Nice smooth trigger pull without a lot of recoil. Very accurate and no jams. Buy this gun, you won’t be disappointed. This pistol is everything the manufacturer says it is. Definately a keeper. For a small pistol it has very little flip, the recoil is not offensive and the trigger is very good. I have another single stack fierarm made by Walther that I've enjoyed for many years, but the shield is superior. Love this gun, and the price was awsome!!! Had the pistol two days after I ordered it!!! Very happy with the entire process. Nice size,fit, quality and not too expensive. Great gun for concealed carry. bought as a concealed, so fa so good. I use it for summer EDC under a large tee shirt. So far I have 1000 rounds down the tube without a hiccup of any kind. The porting does help a little but don't expect a huge difference. Good trigger with a short reset, very accurate, sights are a real plus and easy to pickup, and light weight. S&W has made over a million M&P's so the bugs were worked out long ago. I did get mine at $399.00 from Grabagun which was an unbelievable price. I have the Performance Center Shield in both .40 cal and 9mm. I carry the 40cal when feeling good, and the 9mm when my arthritis flares up in my hand / wrist. Both fit perfectly in my hand with very low perceived recoil. I also added a Hogue Grip Sleeve to mine and they are perfect now. Love this gun. The only change I made was to add a grip sleeve. Shoots spot on straight out of the box. I bought the shield first and then caught the performance center model on sale and bought it too. Better trigger and a little less recoil. Get yourself one. You will not be disappointed. The Shield is not the most fun fun to shoot. I shoot with it regularly as it is my carry weapon. I do not recommend the performance upgrades. The trigger pull is not particularly comfortable. The light gathering sites work well outside and likely for young eyes. I shoot at an indoor range where the upgraded sights are difficult to see. I used some white paint to outline the sights and now they are much easier to see. The light gathering rods are fragile and the front site rod has already broken off. I'm fairly gentle with my weapons so I'm not sure how it broke off. The hole left by the broken rod is much easier to sight with. I shoot with several weapons and the fun and the weapon I am most accurate with is the full size 9mm SAR which was much less expensive than the Shield. This is my EDC 95% of the time. It has performed flawlessly. Easy to conceal. Great firearm, extremely smooth shooter, good high vis sights although with porting the front sight disappears after a magazine or two. Only complaint is the firearm does not ship with a hard case. Highly recommend anyone looking for a solid 9mm. I bought this gun specifically for conceal carry. I am a small framed woman and had trouble in the past finding a gun that would not imprint and was not too heavy. This gun is everything I was looking for. It is very smooth and fun to shoot. I know that if there is ever a time to use it, I will be confident that it won’t let me down. The S&W, M&P 9 shield. Performance center 3 inch barrel is the perfect handgun for concealed carry. 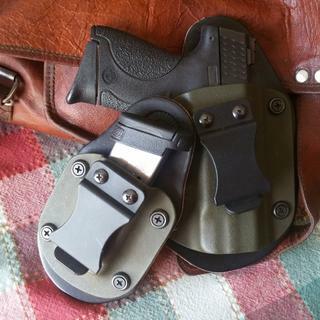 I carry inside the waistband in a VersaCarry all leather vs-3 clip-on holster and I hardly know it there. At the range, inside 15 yards its deadly accurate. What more can you ask for in an everyday carry gun? Very pleased with this firearm. Out of the box it performed better than I expected. Eats ammo like a machine and shoots where you point it. The M&P Shield is an easy to conceal pistol that offers professional grade features with simple operation and reliable performance day or night. The Performance Center Ported M&P9 Shield offers discerning shooters premium features including a factory ported barrel and slide. One million Shield owners can’t be wrong.